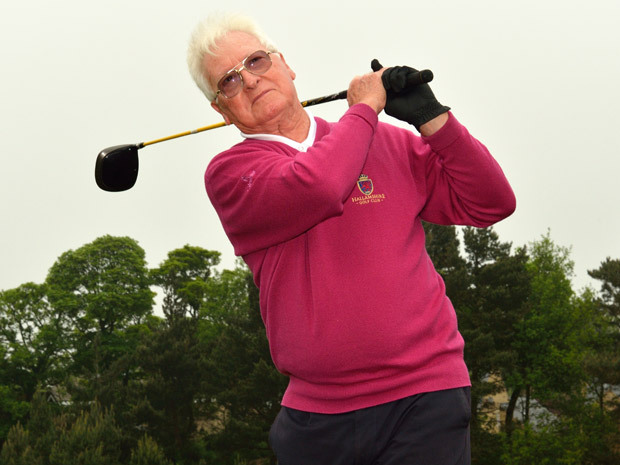 Crosspool golfer Garfield Siberry has got his swing back on Hallamshire Golf Course in a record breaking one-month after suffering a shoulder injury. Unlike previous treatments where his recovery has taken over a year, this time Garfield was back with his nine iron in time to celebrate World Golf Month with his buddies. It was while moving a wardrobe upstairs at his home in Sandygate Road, Crosspool last November that Garfield felt a tear in his right shoulder. Having suffered from frozen shoulders in the past, he sought treatment from his GP. Garfield is a retired schoolteacher and has been an avid sportsman throughout his life. He has experienced his fair share of sporting injuries, including a broken vertebra in his neck while at rugby training, and has since moved away from contact sports. He now tees off at Hallamshire Golf Club several times a week instead. He went to the Barlborough Treatment Centre near Chesterfield for treatment, on the recommendation of his golfing friends. Care UK Orthopedic surgeon John Va Faye said although Garfield’s overnight recovery is quite rare, there are several tips that can help other keen golfers to get back into their swing quickly. Despite some patients requiring surgery, Mr Va Faye said just like Garfield many can overcome their injuries through less drastic measures. This entry was posted in crosspool, health and fitness, news, sports and tagged hallamshire golf. Bookmark the permalink.